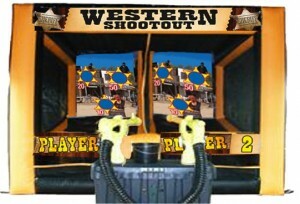 Wild West Shoot Out is a great way to compete against your friends, with a Twist!! This target shooting game comes with the cannon ball blaster box. Drop the Nerf ball in the top and let the ball fly. This is a fun way to play a target game by adding real aiming skill. This game is perfect for School carnivals, graduation parties. Birthdays, or just some good old fashioned back yard fun.